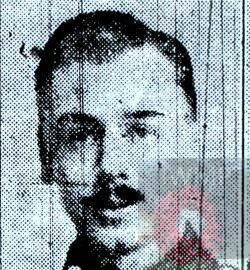 Died: 22nd August 1918; age 26; Died of Wounds – had only just been awarded the Military Medal. Served 8 years in the Essex Regiment. Residence: 27, Bramford Road, Ipswich. Date of Entry Therein: 25th April 1915 – Balkans. Rank: Sergeant; Service Number: 9520. Regiment: Essex Regiment, 9th Battalion. Medals Awarded: Victory, British War & 1915 Star + Military Medal. Relatives Notified & Address: Son of Rose Hill (formerly Denny), of Ipswich & the late Charles Denny; Husband of Emily Parker (formerly Denny), of 39, Rendlesham Road, Ipswich. 1901 90, Finchley Road, Ipswich. Charles was 7 years old and living with his parents & siblings. Charles William Denny, 35, a Stone & Mable Mason, born Ipswich. Rose Ann Denny (nee Nunn), 32, born Gosbeck, Suffolk. Rose Annie M. Denny, 9, born Ipswich. Albert Denny, 5, born Ipswich. William Dennis Denny, under 1 month, born Ipswich. Charles’s father Charles William Denny died, 1908, Ipswich. In 1915, Banbury, Oxfordshire, Charles married, Emily Prince, born 1896, Banbury, Oxfordshire.